Over the years, horror games have tackled most genres from first person right through to driving games. You would be hard pressed to find a genre horror hasn’t touched. 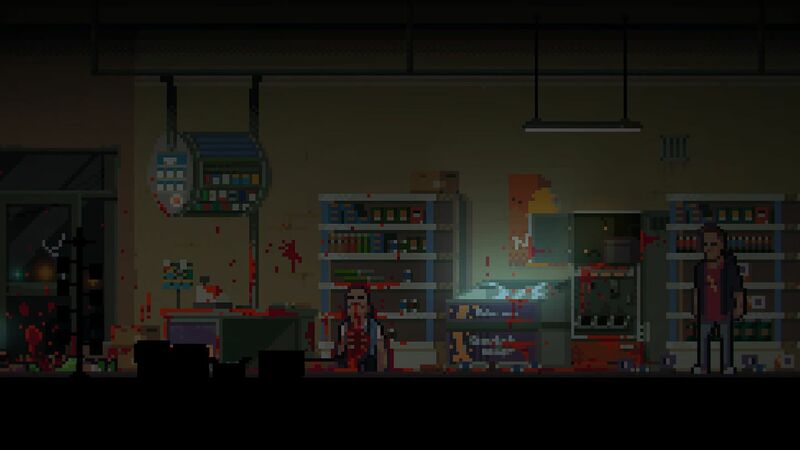 The Long Reach takes the choice of bolting horror on to the 2D side scrolling genre, and while it certainly isn’t the first game to tackle the genre, it at the very least tries something a little different with it. But how does it stack up? 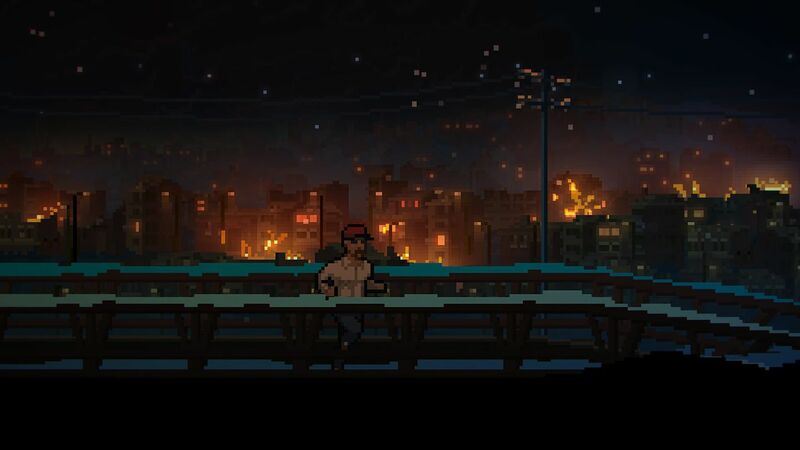 The first thing that strikes you is the art style; the pixelated design on both environments and characters is well crafted and beautifully animated, and areas are well grounded, dark where they need to be. Characters are well designed, believable and fit perfectly in their surroundings. The game is set in the fictional US town of Baervox and offers a really strong variety of scenes to explore. Initially you take on the role of Calvin as he visits his local store. It is here where some introductory conversations take place before the drama really unfolds and you are introduced to Stuart, the main protagonist. Taking part in what appears to be a human based science experiment, predictably the experiment goes wrong and Stuart finds himself in a psychological rabbit warren full of reality bending twists and turns, leaving you fighting your own sanity while navigating head scratching puzzles and dialogue options that are designed to test just what reality really is. Right from the off The Long Reach cements how much it relies on conversations between characters to convey the story. Text is brought up at the bottom of the screen in a darkened portion, and it’s a nice touch that leaves you grounded in the world rather than having text floating all over the place. Colour is used to show who is talking, but sometimes the choices used are too subtle and can leave you needing to read over a few times to work out who has spoken. 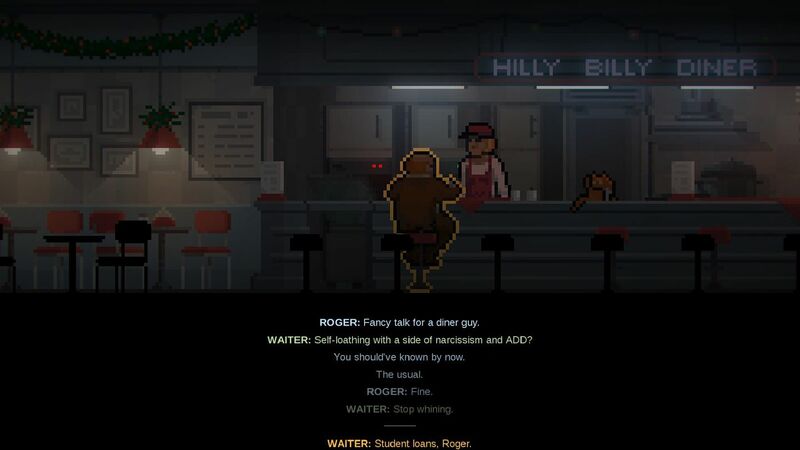 The game also uses these conversations to add an element of comedic break to the situations and it does a great job of this, using pop culture references to great effect as it pulls you out of the horror just enough to let your mind recover before diving back in. Controls and general mechanics are fairly simple and easy to get a handle on. Left and right are your only directions of movement, with an interact button as well as one for sprint also included. Once a few items are collected you also have access to a torch mapped to the shoulder buttons. The game provides a helpful glow around objects and characters that can be interacted with. This however is most often used to throw you off the trail with bizarre unimportant conversations or objects that are just there to look at. You find yourself revisiting places, just clicking through everything in the hope of finding exactly what you need and it becomes a simple case of trial and error, with many of the objects you need seemingly connected in pretty farfetched ways. This never really becomes frustrating though; it’s a nostalgic throwback to point and click games of the past where you end up just mashing the mouse all over the screen in bizarre attempts to move the game forward. In fact, it’s actually a pretty good homage and is used well to keep you plucking away and moving forward. Who knew a dog’s chew toy could be used to operate a shorting elevator button! During The Long Reach you will come across a few instances of chase scenarios, these are often against maniacs wielding a weapon of some kind, but Stuart has no way to defend himself so the only option is to run. The problem here is that the game is never clear on what needs to be done so you find yourself running around clicking everything to try and stop the chase, but more often than not you find yourself dead. It can be incredibly frustrating and even more so when you find that the solution was fairly simple all along. The game has a fairly generous auto-save system though, and you can ensure it saves by dropping into a concealed spot like a toilet cubicle or locker. Audio is used to absolutely brilliant effect, often ramping up the scares with strong crescendos and used to provide environmental hints. I have at times found that it tries to signal a scare where there isn’t one and this can sometimes get in the way, but overall sound is used to an excellent degree. If anything it adds an extra layer of ambience that pushes it further into horror than it would otherwise have been. My one real gripe though is a pretty big one. Despite initially making sense, the plot quickly spirals out of control, leaving many things unexplained and by the halfway point you find yourself scratching your head trying to work out exactly what is going on. Motivations are not explained well and the reality bending moments leave you wondering what is actually going on in the game. It doesn’t help that scenes often have you taking on the role of someone else before Stuart shows up, and these are often just conversation pieces that do very little to move the story forward. By the end you may find yourself unsatisfied and unfulfilled by the plot. Overall though The Long Reach does a good job of what it sets out to do. It has some strong horror elements that provide great scares and doesn’t shy away from showing the reality of the situation that Stuart finds himself in. There are issues and none more so than the plot, but if you don’t care for story then you will find a few really good scares here but not much more. Those with an interest in plot development will find a well rounded if confusing experience that offers a decent amount of enjoyment on the way. Middle aged dad with a love of games and a passion for this industry we all love!